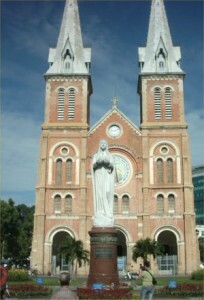 Saigon (now H Chi Minh City) famous of the Vietnam war. We arrive at Tan Son Nhat Airfield. 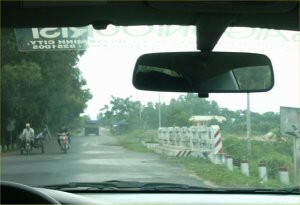 The American built Airport was first thing grunts would see upon arrival in Vietnam.We had a private tour throughout our visit (as we did during the all of our SEA trip) and were delighted to be driven around in a private car, with our own personal guide. 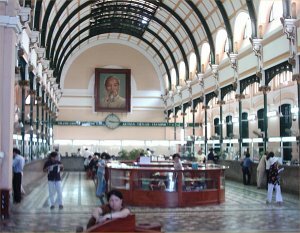 The city was renamed Ho Chi Minh City, hours after it was taken by the North in 1975, but practically everyone still calls it Saigon. 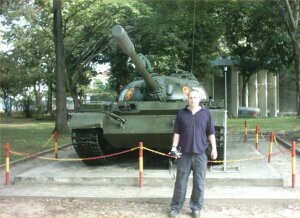 We visit the war remnants museum, which contains tanks, helicopters, planes and bombs from the American War (its isn’t called the Vietnam war in that country). The museum had originally been named the museum of American war crimes.Not many American tourists wanted to visit a place like that. Its name had been changed. 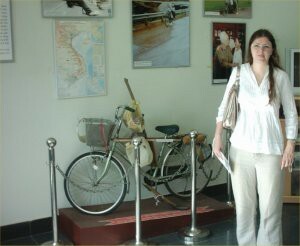 This bicycle had been owned by a female supporter of Ho Chi Minh. Although the name of the museum had changed, its content hadn’t. She had been tortured horribly whilst in prison. The exhibit said simply that after she had been released she had been incapable of performing the role of wife or mother. Sarah and I chose not to think about what that meant. 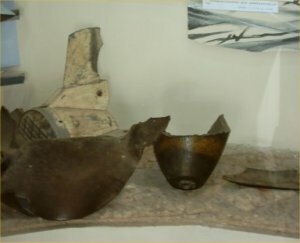 Bomb casings.The explosive inside ripped easily through the 2 inch thick steel casing. During the war, the Americans had dropped 8,000,000 tons of bombs on the country – more bombs than the allies dropped in the whole of World War 2. The shrapnel from this must have been devastating. 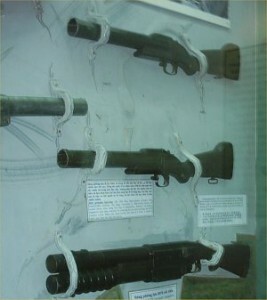 Various forms off the M79 grenade launch.It fires high explosive grenades, and in operation functions much like a pump action shotgun. Although designed as a counter ambush weapon, it had on occasion been used as an interrogation tool. There was a horrible picture of a person who had been shot with one (I’ve chosen not to show it, but you can Google and find it if you wish). Notre Dame Cathedral, the largest Catholic Church in Vietnam. The central post office a beautiful building.The Cathedral and the Post office are both in the main square in Saigon, which during the war was named the JFK square. Inside the post office.A person who had worked there for years and retired, worked freelance inside the Post office as a translator. 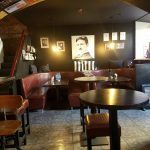 On the back wall is a picture of Ho Chi Minh. People talk about him in the present tense even though he passed away some time ago. He is practically worshipped in Vietnam. Cholon, Saigon’s Chinatown district.Mopeds are the main form of transport in Vietnam (for example, there are 3m people in Hanoi, and 2m motorbikes !). During rush hour it can be terrifying as tens of thousands of them invade every part of the city. 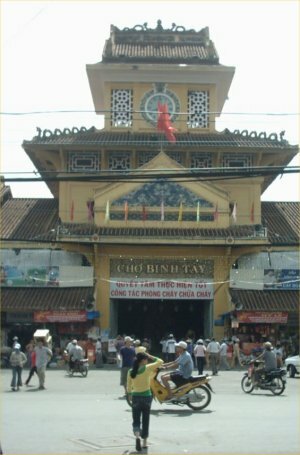 The Binh Tay Chinese Market.Originally built by a wealthy Chinese business man who started life as a homeless orphaned beggar. He later amassed enough wealth to be able to give the Market to the city as a gift. It was absolute mayhem in here. They sold everything you could think of, and actually had dried sharks fins for making soup. Thien Hau Pagoda.The largest Buddhist temple in Saigon. 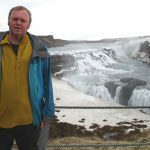 There are so many things to see and do on a trip like this, Sometimes its nice to visit somewhere quiet and relax. 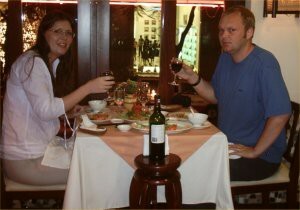 We stayed at the Rex Hotel on the main square.In the evening, we had a traditional 7 course Vietnamese meal. Traditional music and dancing were performed while we ate. 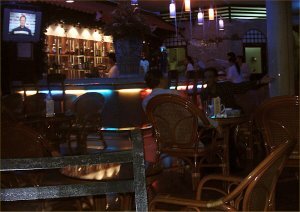 The rooftop bar of the Rex Hotel is practically an institution in Saigon as it has amazing views of the city.During the war, the Rex hotel was used as officers quarters. 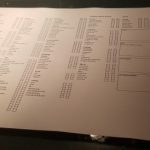 We took a small laptop with us, and were able to connect to the Internet in all of our hotels. 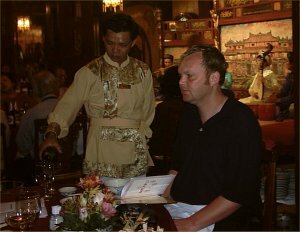 It was also useful to research the things we had seen/were going to see. 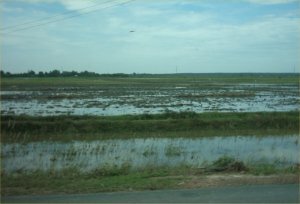 The next day, we head out in search of adventure.One of the many paddy fields that panorama’d our journey. I found out on my trip why rice is grown this way. Rice can grow underwater, but weeds and other vegetation can’t. Instead of using weed killer, just grow the rice underwater, and let nature do the work. 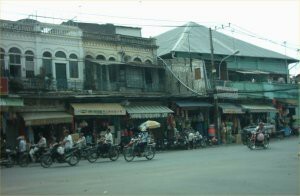 The image of the young girl fleeing a burning village, covered in napalm, immortalised the war.This is the section of Trang Bang Road (named after the bombed village) where that picture was taken. Today, Kim Phuc lives in Canada and works for the United Nations. Her brother still lives here and sells burgers from a van a quarter of a mile away. 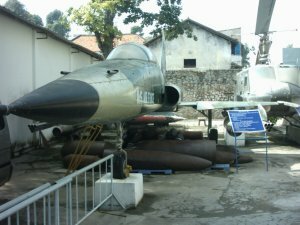 The reality of the story, is the Vietnamese Air force were responsible for the attack The Americans were not involved at all. 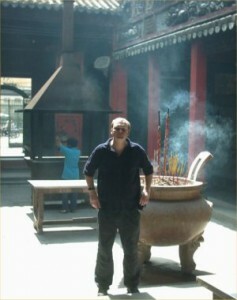 The famous Cai Dao temple.Cai Dao fuses Buddhist, Taoist, Confusionist and Catholic beliefs. The 9 levels of enlightenment are symbolised by 9 steps within the temple. Each level is guarded by 2 dragons and the top level features the symbolic eye of wisdom. 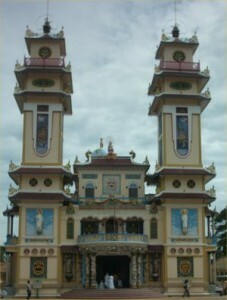 On the temple grounds are schools and hospitals for the followers of the religion. 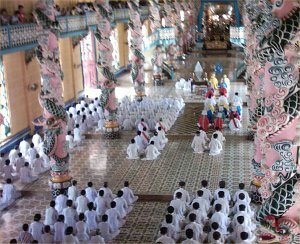 Cai Dao is a multi faith religion, unique to Vietnam.Apprentices initially wear white robes, then progress to either red, blue or yellow robes dependent on the discipline of the religion that they pursue. Sections of the temple are devoted to Victor Hugo !. 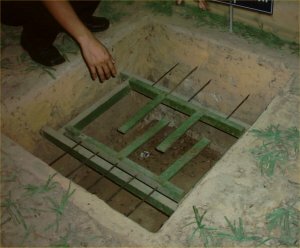 We went to see the famous Cu Chi Tunnels, 90km from Saigon.During the war, the Vietcong had setup a series of tunnels, which they used to conduct covert warfare. 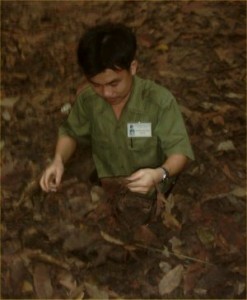 We met our guide (dressed in full revolutionary garb) and were led down a narrow trail, into the Jungle. There were swimming pool sized craters one either side of the path, where B52 bombers had left their mark. We stopped to look at a diagram of the tunnels, then watched a propaganda film. 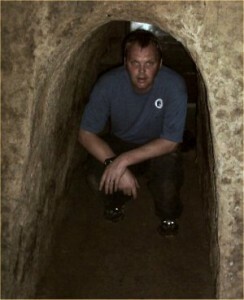 Here we were shown a section of ground, and invited to try and find the tunnel entrance. After spending a few minutes, and finding nothing, our revolutionary, finds the trapdoor easily, and climbs in to his waist.The tunnels went down 3 levels, and even the first level, 3 – 4 metres bellow the surface, could stand the weight of a 50 ton Tank driving over it. During the war, the 25th Infantry division were based here (right on top of the tunnel network), didn’t know of the tunnels existence, and could never work out where the sniper fire was coming from. Estimates at the length of the tunnels, vary from 75 – 200 miles. We get a chance to go into one of the tunnelsThey were amazingly equipped, with mess halls, sleeping quarters, operating room, printing press and even a small cinema. 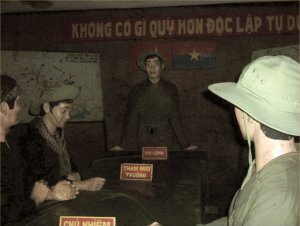 A briefing room, with replica people taking the role of wartime commanders. On the surface, innocent looking termite mounds, were hollowed out to provide an air supply to the tunnels. A similar technique, in reverse, took cooking fire smoke miles away from the actual tunnel network to prevent detection. Many of the original tunnels, had booby traps to thwart any attempt at compromising them.We travelled down to a 2nd level tunnel. These could withstand direct overhead bombing from a B52. They were cramped and hot, and the air was very thin. I can only imagine the physical and mental toughness of the people who lived in them. 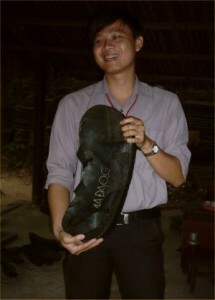 Our guide Long, demonstrating Ho Chi Minh Sandals, made from tyres (they were overly large for demonstration purposes).Ho Chi Minh wore a pair of these sandals throughout the war. They were practical and tough, like the people who wore them !. We were given a sample of food the tunnel dwellers would eat. It looked like banana, and tasted of sweet potato (grim!). They only received rice once a week, as a treat. Next we had a tour of various forms of traps. 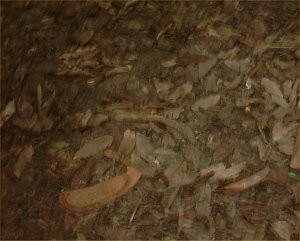 Some of them, looked absolutely terrifying.A tiger trap, is just a big hole with punji sticks in it, right through to small portable devices, which could be carried, and then deployed along a trail. The most ingenious thing I saw, was how they had dismantled unexploded bombs and used them as booby traps. 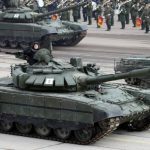 In this way, it was possible for lightly armed fighters to ambush an entire tank. 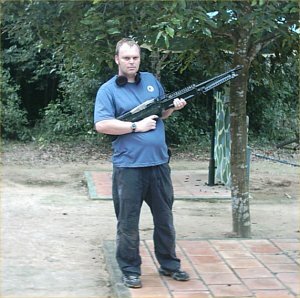 We were given a chance to fire authentic Vietnam war firearms.I got to fire an M60 heavy machine gun. I have seen them on the television, but the power of one of those things is devastating. You point it at the target, pull the trigger, and there isn’t much of the target left !. 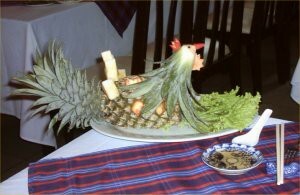 We had more superb food at a restaurant near the fashionable Dong Khoi shopping area.The exchange rate for Dong, was such that £41 would purchase a million Dong. Notes of less than 200 Dong, are worth less, than post-it notes and are frequently used for this purpose. 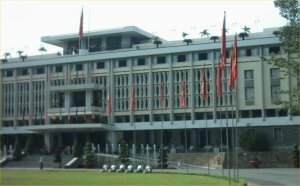 The former presidential palace, now named re-unification hall.The presidential palace was very 60’s is in style, and had been the site of many parties and fashionable social gatherings. 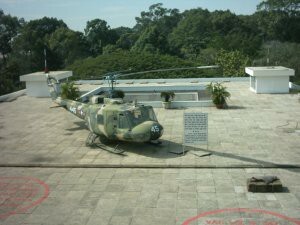 A terrace on the roof was used for entertaining (JFK had attended parties here).Just underneath this, an American UH1 (huey) helicopter, on the rooftop helicopter landing pad. 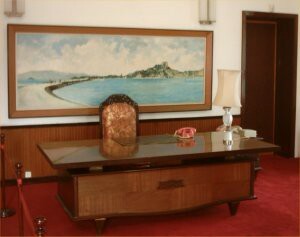 Its maintained exactly as it was on the morning, in 1975 when the war ended.The presidential desk. 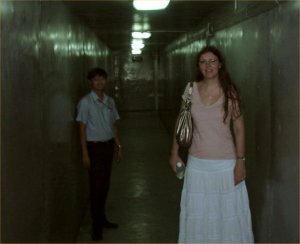 Our guide long, with Sarah in the basement tunnels underneath the palace.They lead to the telecom and war rooms. 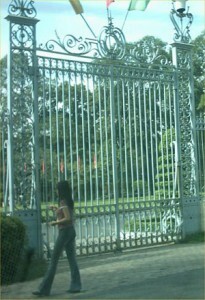 It is rumoured that a secret tunnel allows people to leave the palace unnoticed but the government will not confirm or deny this. 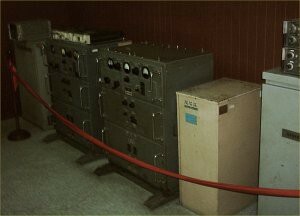 The bunker reminded me of the building at the end of Terminator 3, with 30 year old computers.A “portable” radio system, for use when the palace was attacked/under siege. America first sent troops to Vietnam on the 8/3/65. 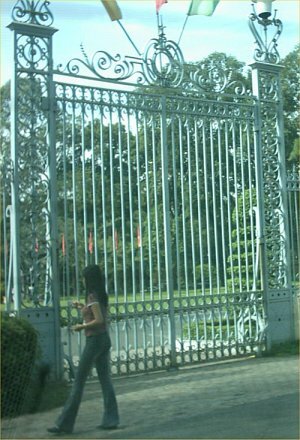 They left 10 years later.At 11:30am on the 30th of April, 1975, NV tanks crashed through those gates, and Saigon fell to NV forces. The acting president (who had only been in office for 26 hours) surrendered. Many people remember the scene from TV pictures.This is the actual tank that arrived at the palace. 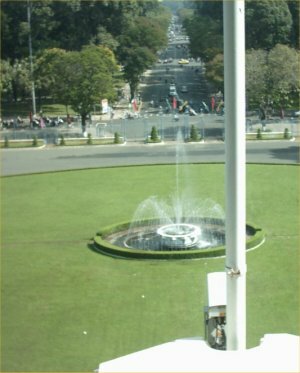 This is the view from inside the palace.It shows the view from the flagpole where the flag was hung. It marked the end of a war for independence which had begun in 1945 with the French, and was finally over. America lost 65,000 troops, Vietnam lost 3,000,000. 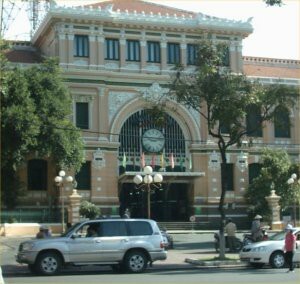 Today, 2 out of 3 Vietnamese, are under 30. On a lighter note, we had lunch afterwards, and the restaurant had made up a pineapple in the shape of a chicken, which was smart.